Michigan Jack Russell Rescue View other Jack Russells for adoption. 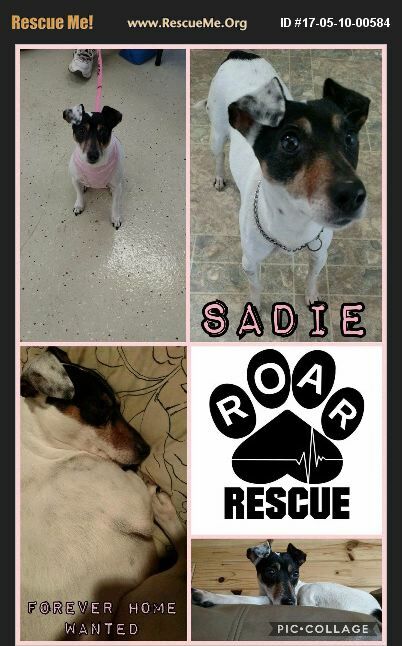 Sadie is a 9 yr old Jack Russell/Rat Terrier mix looking for her forever home. She's a very sweet and special girl with a calm disposition. She's very outgoing and LOVES everyone. Young children and hyper dogs that get in her face tend to make Sadie nervous when they catch her off guard, which can cause her to nip, so she will benefit best in a calm, quiet environment without young children or dogs that won't give her the space she needs. She does do fine with dogs that are more at her speed. We were told she's 100% deaf but we do wonder if at times she can hear certain noises. Sadie is housebroke/crate trained and completely vetted and spayed. Her adoption fee is $250 with an approved application (plus the fee towards gas for any home visit/possible adoption). There is more information on the adoption application. If you have any further questions or would like the adoption application, please contact us!